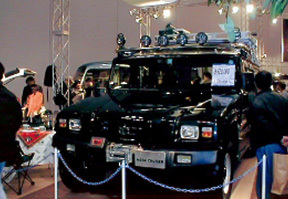 History of Gifu Auto Body | Gifu Auto Body Co.,Ltd. 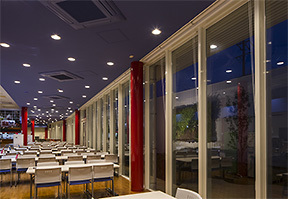 October Gifu Auto Body Co., Ltd was established. Kagitaro Hoshino assumed office as Representative Director and President. 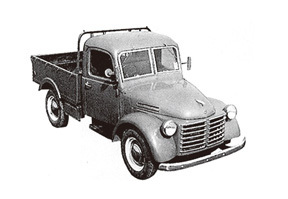 With the end of the war, began production of regular Toyota truck bodies. A labor union was formed. April Production of the first model truck (SB-type Truck). Began supplying pressed parts to Toyota Motor Corporation. May The Gifu Auto Body Cooperation Society was founded. September Merged with Hoshino K.K. 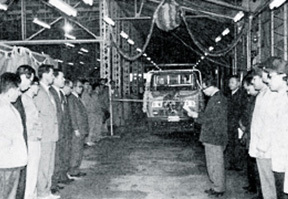 Began trading of vehicles with Toyota Motor Co., Ltd.
December Began production of the FJ45V (Land Cruiser). The Ginan plant in Ginan-cho, Hashima-gun, Gifu was completed. October Began production of the RK175 (Dyna Long Body). July Production of the RK170 (Dyna) began. April A memorial ceremony was held to celebrate the 30th anniversary of the company and the completion of its Head Office. November The Ginan Plant was merged with the Main Office. May Sadanosuke Nameda assumed office as Representative Director and President. December Toyota Quality Control Award , Wins the Toyota Excellent Quality Control Award. June Yoshihiro Fujii assumed office as Representative Director and President. August Began production of the Stout. September Began production of the Dyna (5th generation). August Began production of the ToyoAce (5th generation). June Began operation of a large scale press line. June Tetsuo Hoshino assumed office as Representative Director and President. October Capital was increased to 1.175 billion yen. A memorial ceremony was held to celebrate the company's 50th anniversary. May Established the Sue Plant (a seat track component assembly plant). October The Hiace Limo, Toyota Ambulance and Mira Milano were exhibited at the 29th Tokyo Motor Show. 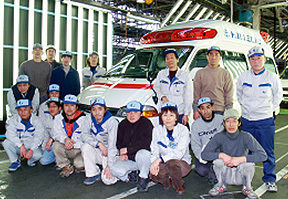 July Began production of the high-standard ambulance, Himedic. January Began operation of a new finish coating line. May Began production of the Dyna (6th generation) and ToyoAce (6th generation). January Began production of the Mega Cruiser. May The Gifu Auto Body Labor Union celebrated its 50th anniversary. May Began production of the Himedic (2nd generation). June Began operation of a new 400 ton progressive press line. May Began production of the Dyna (7th generation) and ToyoAce (7th generation). 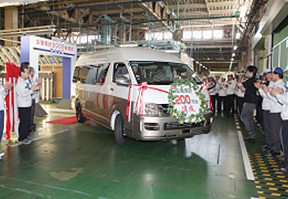 July Began production of the Hiace High Roof (4th generation). October Acquired ISO 14001 (environmental management system) certification. June Tetsuo Hoshino assumed office as Representative Director and Chairman, Tokio Kurita assumed office as Representative Director and President. September Began operation of a second shift at the vehicle plant. February Began operation of a 1,200 ton automatic progressive press. April A new wage system was implemented. March Acquired ISO 9001 (quality management system) certification. Employee's pension fund plan was dissolved and a defined contribution pension plan system was initiated. January Began production of the Hiace Super Long (5th generation). January Acquired OSHMS (occupation safety and health management system) certification. May Began production of the Himedic (3rd generation). August A new components plant was completed. June Katsuhiko Nakatani assumed office as Representative Director and President. October Began stock exchange with Toyota Auto Body to become a 100% subsidiary of Toyota Auto Body. June The Second Paint Plant (a new second paint facility) was completed. May Total cumulative production 2 million units. June A commemorative concert was held to celebrate the 70th anniversary of the company's founding. Hirofumi Yamada assumed office as Representative Director and President. September Began production of Large plastic parts. February Began production of SKD. June 70th Anniversary book published. October Began production of CKD. July Transferred seat truck business to TOYOTA Body Seiko Co.,Ltd. January Began production of the Coaster. COPYRIGHT GIFU AUTO BODY All Rights Reserved.